Posted 18 January 2011 in Bonus, Cooke Looks, The New Gods #3. But, putting aside the costuming, The Black Racer does work, I think, and it’s hard not to get wrapped up in lives of Willie, his care-giving sister and her husband, all trying to get by in Suicide Slum. But I really dig the idea of a Grim Reaper, even one on skis, playing a direct role in the epic. Whose side is this personification of death on? Certainly Darkseid and his ilk ultimately worship death — what else is anti-life? — but their fear of The Black Racer (they’re as afraid as their New Genesis adversaries of BR’s mortal touch) shows us he’s neutral, ambivalent even. Very cool. 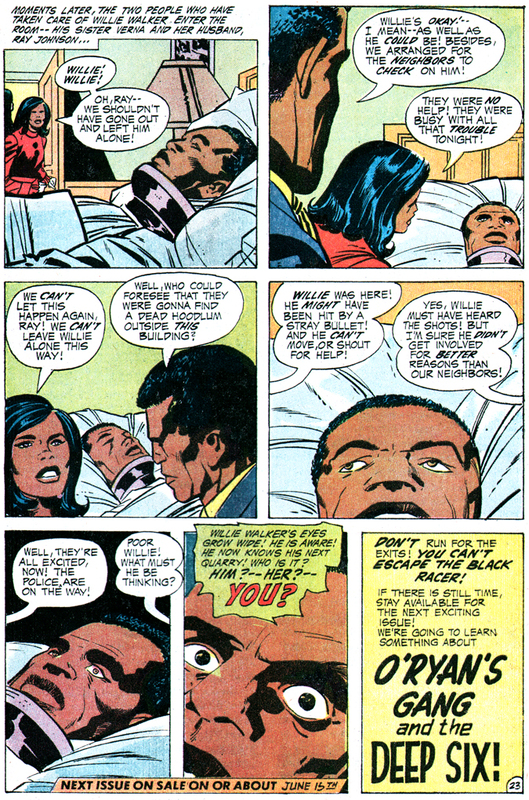 I’m also a fan of Jack’s (for lack of a better term) “Blaxpoitation” work at early ’70s DC, so I do respond to the Walker subplot. Jack may be off-target now and again, trying a little too hard to be hip and with it, but like his extraordinary romance work with Joe Simon, he remains earnest and empathetic with minority characters. If you haven’t seen his Soul Love work from that era, you’re missing a treat and you must seek out those unpublished stories. Wild stuff. 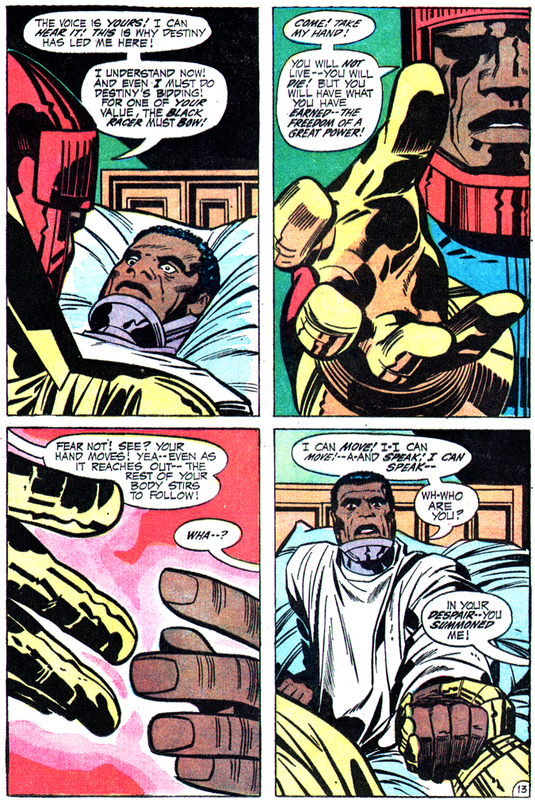 One could argue from the get-go Jack painted himself into a corner with the broad strokes of Willie Walker’s ordeal — paralyzed, completely dependent on his sister — or never took the chance to expand in the short time left for the Fourth World. In the few appearances to follow, the Vietnam vet’s situation remained the same: him lost in thought, his sister Verna fretting over his fate and brother-in-law Ray comforting the sister… a person might imagine Jack moving The Black Racer to another mortal vessel just to get things jumping! Anyway, The New Gods #3 is a fine issue and, however clunky he looks, The Black Racer is a worthy addition to the opus. 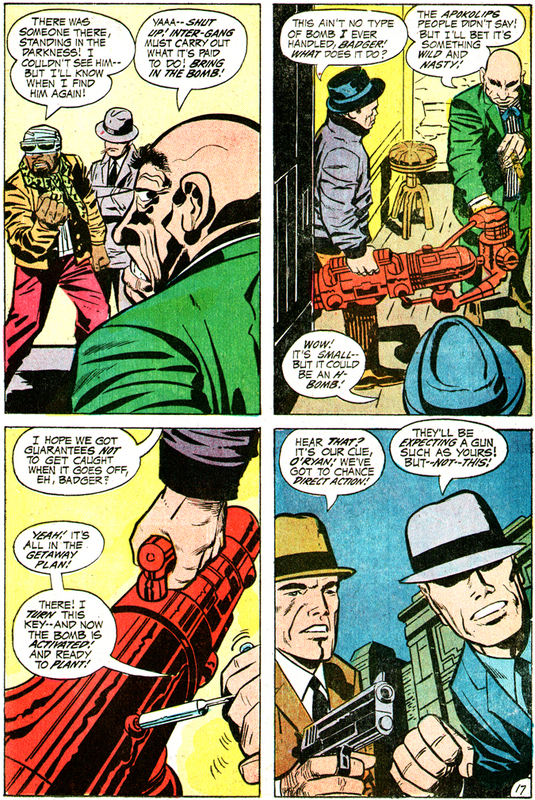 It’s also fun to see a two-fisted, Earthling-attired Orion duking it out in the Metropolis ghetto, and while Sugar-Man and Badger are hardly candidates for membership in the Secret Society of Super-Villains, they are classic if unrefined Kirby bad guys, so no complaints here! Jack is chugging along, gaining momentum, building tension… things are starting to rock! Day 109: “Wild and Nasty” Communications Bomb! 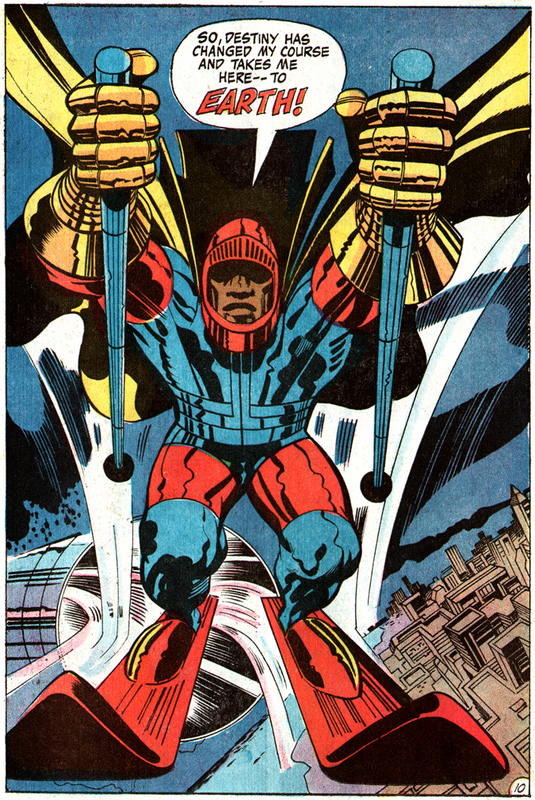 Posted 17 January 2011 in Apokolips, Day Entries, The New Gods #3, Weapons & Devices. Still holding the weapon, the minion comments, “I hope we got guarantees not to get caught when it goes off, eh, Badger?” The crime boss turns a key in the side of the explosive and replies, “Yeah! It’s all in the getaway plan! There! I turn this key — and now the bomb is activated! And ready to plant!” Then all hell breaks loose as Orion and Dave Lincoln smash into the hideout to capture the baddies and stop the nefarious plot. A battle ensues and Badger orders Sugar-Man not to engage in gunplay. 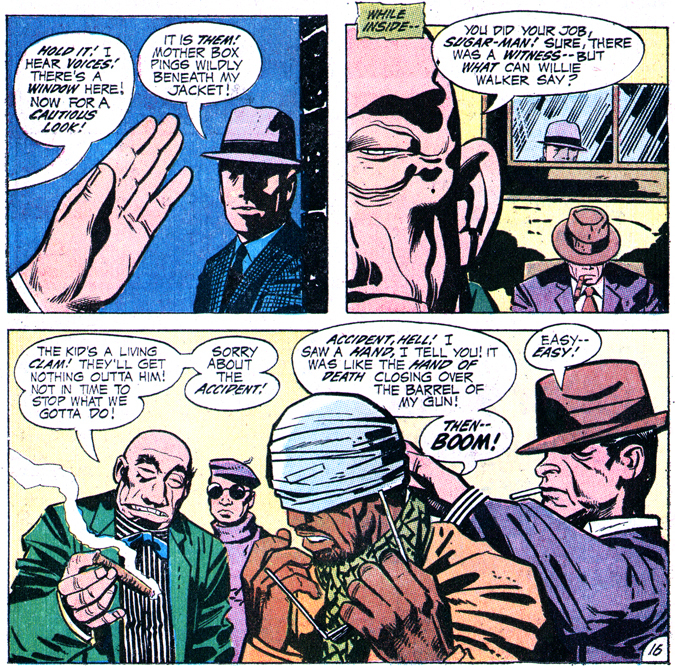 “Stash that pea-shooter, Sugar-Man! Take the bomb! Plant it where the Apokolips crowd designated!” The bandaged assassin complies and scurries out a back door. He loads the bomb in the back of a truck and races to his destination. 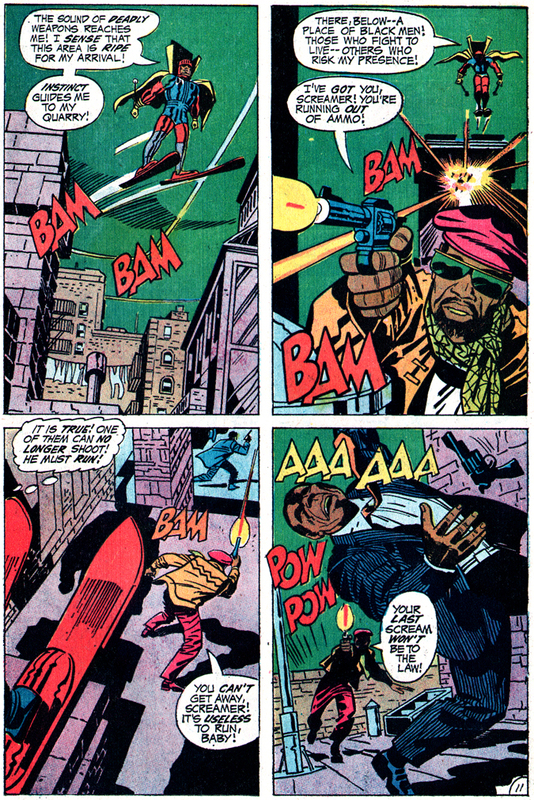 But The Black Racer is in pursuit and he causes the device to sing a “song of death” — a high-pitched, continuous electronic screech that scares the beegezzus out of Sugar-Man. “The bomb!! I-it’s not supposed to make those sounds!” But The Black Racer demurs, telling his prey, “Yes, it can, Sugar-Man — when its shell is penetrated by transmitted signals — they enter the truck without resistance — as does my ski pole — then, as the signals reach the mechanized heart of the bomb –” The next caption reads, “Suddenly, as the ski pole touches the bomb…” the truck is hurtled into a space-bound trajectory! Simultaneously, Orion and his private eye friend are cuffing the Inter-Gang goons. Still, Badger gloats, “You cats cooled us, but not our bomb! By now, it’s being clamped on the communications building across town! !” Dave Lincoln responds, “We were too late to stop your man from escaping with the bomb — but perhaps –” Orion eases his ally’s concern. “Don’t worry, Lincoln! Mother Box has intercepted the bomb in transit! And has sent it toward space!” The New Genesis warrior looks to the sky, saying, “Now, the vehicle carrying the bomb is high enough to destruct there! 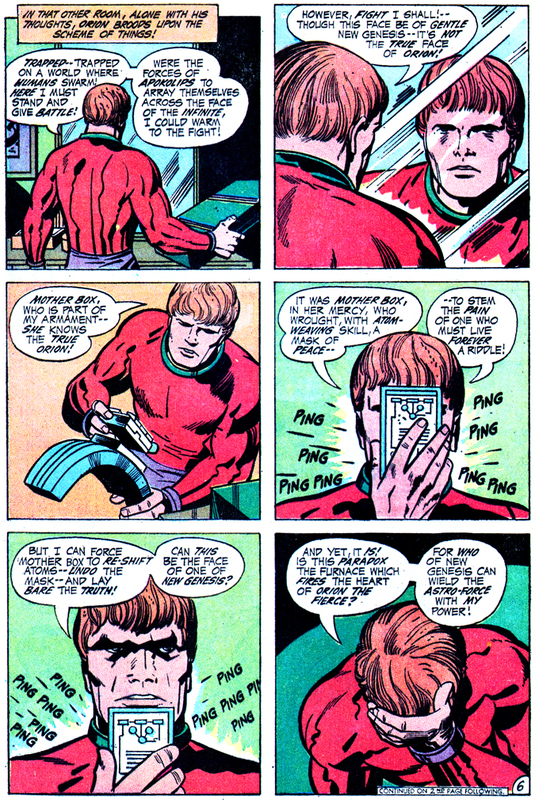 Mother Box sends out her death signal!” Holding aloft Mother Box, Orion is witness to a tremendous explosion. Orion then explains, “I caught a glimpse of that bomb! It would have melted every bit of communication metal within a radius of thousands of miles — No telephones — no television — not even radios or telegraph! It would have meant chaos!” Sounds like the “Wild and Nasty” Communications Bomb would have activated an electro-magnetic pulse, eh? That wily Apokolips crowd! 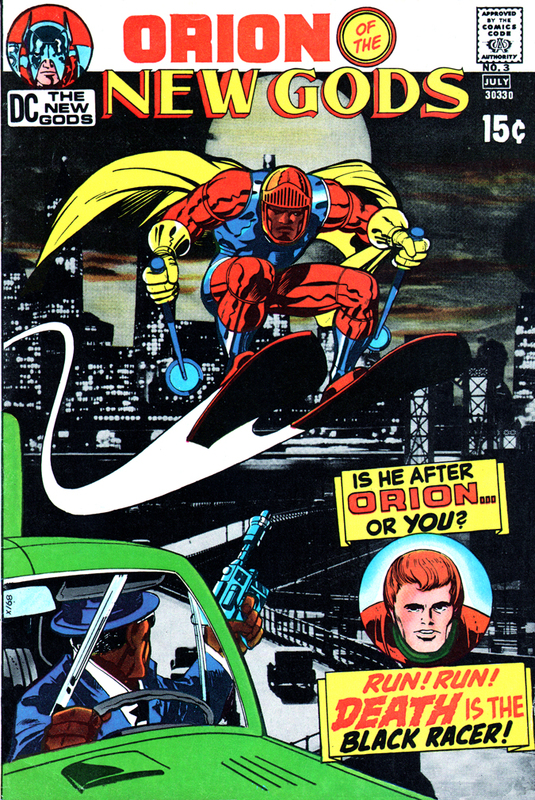 Posted 13 January 2011 in Day Entries, Heroes, New Genesis, The New Gods #3. 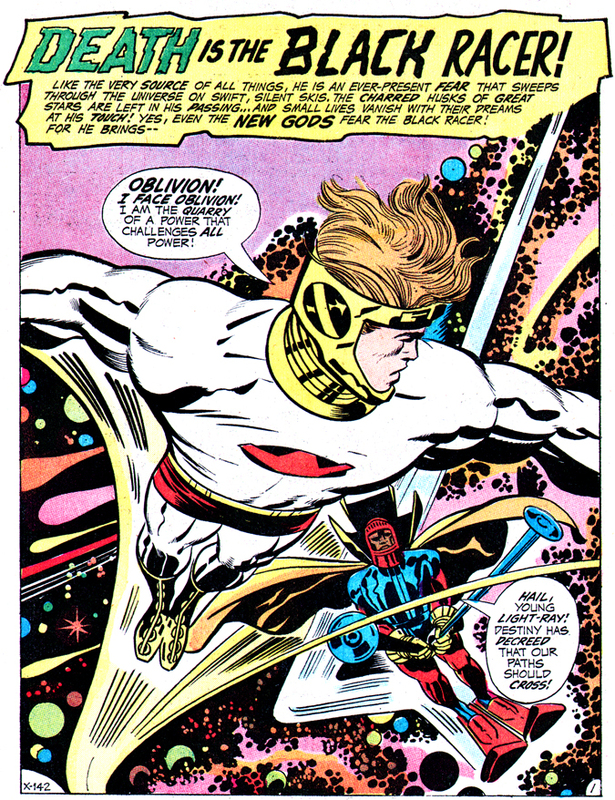 One of the central tenets of the Fourth World saga is the fundamental dual nature of Orion, the depth of which we do not fully understand until the end of the regular series, though hints abound from the very first issue. To the point: Though raised as the charge of Highfather on New Genesis, Orion is born of Apokolips and is the son of his great nemesis Darkseid. His normal appearance is that of a beautiful, auburn-haired Adonis. We know, early on, that he is a particularly fierce warrior, more brutal than his New Genesis allies and we understand, too, that Metron is privy to Orion’s mysterious background. What we only learn as the story unfolds is the gentle visage we first encounter of Orion the Tiger is, in fact, not his real face.